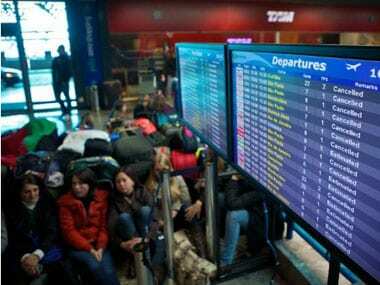 A plume of volcanic ash cloud spewing in Chile forced dozen of new flight cancellations in Argentina, Uruguay and other South American countries again on Monday, causing chaos for air travellers and grounding flights as far as New Zealand and Australia. Moreover, a flight carrying UN chief Ban Ki-Moon to Buenos Aires was diverted to Cordoba because of the ash clouds blowing out of Andes.The eruption of Chile's Puyehue-Cordon Caulle volcano began on June 4 and has now entered its second week, spewing ash that has disrupted air travel on a scale unseen since the volcanic cloud over Iceland paralyzed Europe in 2010. So far 4,000 people have been evacuated from Chile by troops and police.Television images showed roofs and cars coated with ash. Two airports serving Argentina's capital and the main international airport in Uruguay were closed late on Sunday over safety fears sparked by the ash cloud, which has stretched some 10,000 kilometers (6,000 miles). "All flights have been canceled ... according to the weather forecast, the ash will continue affecting (flights) for the rest of the day," said Nelson Rosano, head of operations at Uruguay's Carrasco airport. The chaos hit airlines including Chile's LAN and Brazil's TAM and Gol, which halted services to and from Buenos Aires. Despite the disruption, airports reported little turmoil, as most affected passengers found out about the flight cancellations before heading to the airport. In Argentina's southern Patagonia region, the volcanic ash closed roads and schools, blanketed a ski resort and turned an Andean lake a deep charcoal gray color. UN Secretary General Ban Ki-Moon, in Argentina as part of a regional tour, had to travel about 185 miles by bus to get to Buenos Aires after his flight was diverted to another airport, President Cristina Fernandez said. At the other side of the Pacific, the fine ash particles, which pose a danger to aircraft bodies and engines, also forced airlines in New Zealand and Australia to cancel about 200 flights, affecting an estimated 60,000 travelers. But the cloud drifted higher later on Monday, easing the threat to commercial aircraft and some airline activity resumed. Australia's Qantas Airways Ltd resumed flights in and out of the southern city of Melbourne late on Monday but flights to and from New Zealand and the Australian island state of Tasmania remained grounded Tuesday, it said. Air New Zealand kept in the air by rerouting flights and flying at lower altitudes to avoid the ash. "We will not fly through ash and are constantly taking guidance from the CAA (Civil Aviation Authority) ... to ensure we can continue to carry passengers only where safe routes and altitudes are available," said Air NZ chief pilot David Morgan. Virgin Australia said it also resumed all flights but continued to modify flight paths to avoid the ash clouds. Air travel in northern Europe and Britain was disrupted last month after Iceland's most active volcano at Grimsvotn sent a thick plume of ash and smoke up 15.5 miles. Last April, the eruption of another Icelandic volcano, Eyjafjallajokull, led to 100,000 canceled flights, affecting 10 million people at a cost of $1.7 billion. That was worse than the Chile disruption because it spread ash throughout the air column, from ground level to the upper atmosphere.